For Independence Day, I wanted to make something fun for my daughter to wear. 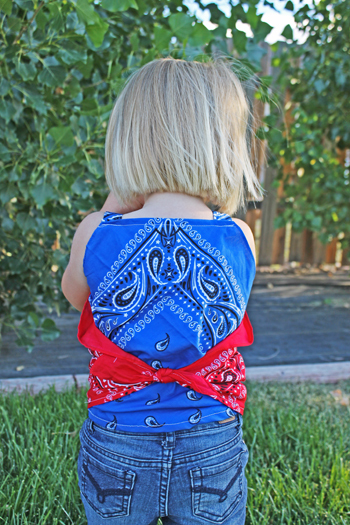 I like bandanas, and thought it would be fun to create a casual shirt with red and blue. I want to clarify, I am anything but a seamstress. I can pretty much sew a (sort of) straight line, and I’m terrible at following a pattern. This shirt is not professional, but is quick, inexpensive, and fun. And, as a bonus, my daughter loves it. 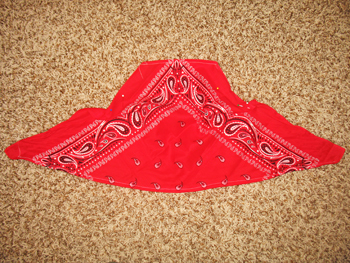 I started by putting the red bandana, at an angle, across her chest and stomach, folding down the corner so it covered her chest and came just a little below the armpits. I tied it in a knot in the back and measured where I wanted it to fall on her waist. I added about an inch and trimmed it, then hemmed it. I also hemmed the top corner down inside the shirt. 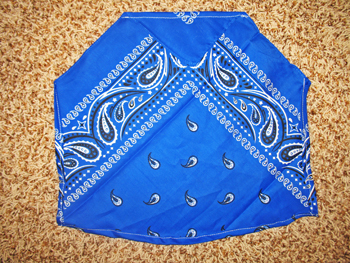 I put the blue bandana on her back at an angle, folding down the corner on the top and taping it to her. I then measured about where I wanted the bandanas to meet on her sides, gave it a couple more inches for hemming, and trimmed the sides. I also trimmed the bottom so it was the same length as the front. I then hemmed the sides, bottom and corner. 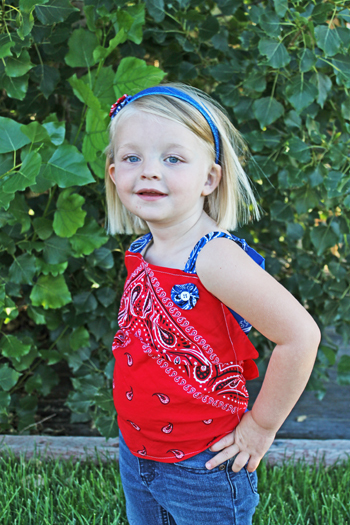 I put it back on her and pinned it together, with the red bandana overlapping and tying on top of the blue. 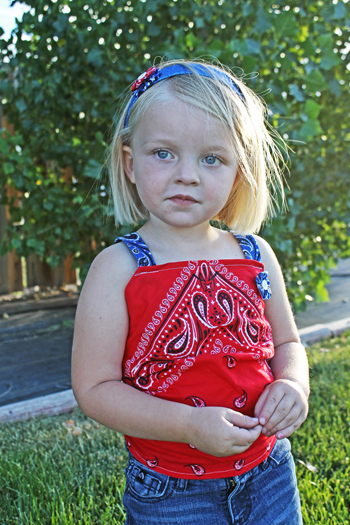 I untied it and carefully took it off her, then stitched the sides, taking care to keep the natural gathers created by tying the red bandana. For the straps, I measured across her shoulders, from the front of the shirt to the back, and for her it was 5 inches. 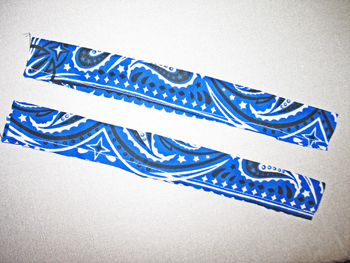 I added 4 inches to that, and cut strips that were 9 by 2.5 inches. I then sewed the raw edges of each strip together lengthwise, flipped them inside out to form a tube, and ironed them flat, with the seam in the center on the inside. I folded the ends over twice, pinned them on the shirt while she was wearing it, and then stitched them on along the seam. For a fun accent, I made a blue yo-yo (because I use every excuse I can to add yo yos to everything). 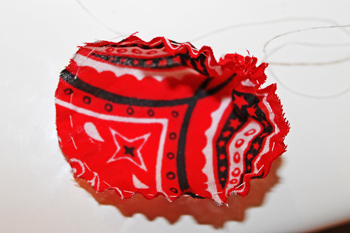 To make a yo-yo, cut a circle of fabric, (I traced a cup) then using a needle and thread, sew loosely around the outside of the circle, gather, tie the thread, and flatten it. I love to put a button in the center, which I did on this shirt. I also made a couple different sizes of yo-yos to stack and glue on her sparkly headband I picked up at Jo-Ann Fabric and Craft for $1. 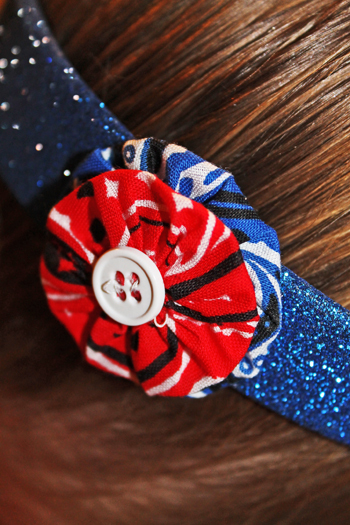 I sewed the two yo-yos and the button together before gluing them to the headband with Krazy Glue. Since I already had the buttons and thread, the entire shirt and headband cost me $3, with about an hour of work. This entry was posted in Projects and tagged Kids, Sewing.